In recent years, the faith-based production company Pure Flix has softened from the fire-and-brimstone fundamentalism of God’s Not Dead and its successors to duller, more mild-mannered fare (including, recently, a barely noticed version of Little Women). Mike Lindell is here to bring things back to noxious basics. The anti-abortion Christian drama Unplanned is the first of three films being (partially or wholly) financed by the Trump-supporting entrepreneur and MyPillow founder. It climaxes with a Planned Parenthood office having its sign torn down; Lindell is in the bulldozer’s seat. “I’ve been waiting for this my whole life,” he says, grinning in a hard hat with the American flag on it—mirroring the TV ads for his product, where Lindell wears a crucifix, and the “call now” screen has an American flag with “Made in the U.S.A.” written underneath. 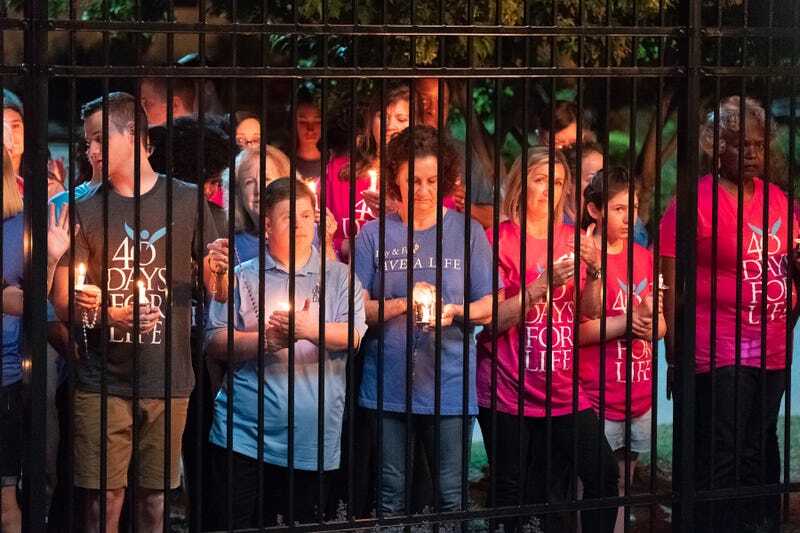 Unplanned writer-directors Chuck Konzelman and Cary Solomon wrote the first two God’s Not Dead movies and are therefore old hands at integrating related talking points into an already dogmatic central agenda. The Trumpian undercurrents here include not just Lindell but also a reminder that one of Planned Parenthood’s primary supporters is, yes, George Soros. (Soros!) Closely following the self-presented, factually unverifiable, and heavily questioned narrative of PP employee-turned-pro-life-supporter Abby Johnson (primarily as recounted in her memoir of the same name), Unplanned’s story is about a mostly devout young woman who had two abortions herself but primarily chose to join the organization to help lower their number via the dissemination of birth control. Besides pantomime-villainy characterization, Unplanned has several other modes of attack. One is good ol’ fashioned scare tactics. There are shots of blood pooling in the socks of abortion recipients post-op; an overhead view of Abby after her second (RU-486 induced) abortion, sprawled out in a bathroom covered in streaks of gore, as if she were the final-girl survivor in a slasher movie; and an actual abortion sequence. It’s the last of these that was the inciting incident for Johnson’s conversion. (Allegedly—her story doesn’t match the records.) She’d never been in the operating room before during surgery, but watching the ultrasound of a fetus kicking to not get sucked out of the womb freaked her out. For this image, Unplanned received an R rating, which seems overly harsh for a cartoonish sequence in which the rendering has the fetus’ hands grasping for dear life onto the uterine walls. The overegging undermines whatever horrific effect this conversion moment is supposed to have. If Unplanned has a point beyond preaching to the converted, it’s to whitewash and separate “responsible” members of the pro-life movement from its outliers. Johnson’s thesis is that not all abortion providers are evil people and should not be vilified as such—they’re merely wrong, and what’s needed is the peaceful but permanent banning of abortion. Furthermore, who could object to a group of people quietly and respectfully praying outside a clinic? They’re not the ones screaming and frothing at the mouth, a few bad apples, etc. Unplanned reaches its disingenuous nadir when a representative from 40 Days For Life explains that they’re videotaping their exchanges just in case someone wrongly accuses them of violence—they have to have the cars, and their license plates, in frame just for the record. What this explanation covers for is a long history of license plate numbers being recorded and used to locate mailing addresses, with women subsequently receiving letters from the protesters. There’s lots more to object to in Unplanned. A subplot reinforces the importance of submission to one’s husband via its portrait of Abby’s patient, perfect spouse, Doug (Brooks Ryan), who’s always wiser than his wife, down to realizing she’s pregnant before she does. (Takeaway: Men know women’s bodies better than they do.) All speaking parts are for white people, with the exception of two black women who come to get abortions, one with her family praying and weeping for her outside the fence—a dog whistle for the folks who believe legalized abortion is just pursuing Margaret Sanger’s goal of using birth control as a way to euthanize African-Americans. Insofar as there is a formal level to this slab of CBN after-school propaganda, Unplanned has greater technical finesse than its foundational forebears. The performances don’t seem like those delivered by actors confused by dialogue read from teleprompters, and the shot choices are logical rather than insanely clunky. But there’s not a single scene that speaks to characters with lives outside their streamlined narrative function; they’re performers in a parable traced over a Chick tract, filmed with a bland competence at odds with the true perversity of the material. Old-school Pure Flix: Welcome back!